Perhaps the Twin Cities' most magical event all year is the Luminary Loppet, a highlight of the urban cross-country ski festival's string of winter events. As night falls, a groomed course around Minneapolis' Lake of the Isles is serenely edged by hundreds of spaced ice lanterns, each enclosing a lit candle. Along its glimmering way, the course leads skiers and walkers to bonfires and illuminated ice structures, fire dancers and fairyland woods clustered overhead with tiny flames. The Luminary Loppet nods here and there to pagan themes but mostly seeks to celebrate the quietness and darkness of winter, as well as an element central to Minnesota's soul  water. This year's event, coinciding with the far more overtly pagan rituals of the Super Bowl in the "Bold North," added quintessentially Minnesota attractions. Along with an ice forest  a Narnian grove of 100 7-foot-tall ice spires participants can stroll among  there was music performed solely on instruments carved from ice. The instruments, sometimes together with voices, included ice xylophones, drums, tubaphones, udus, horns, whistles, and shakers. 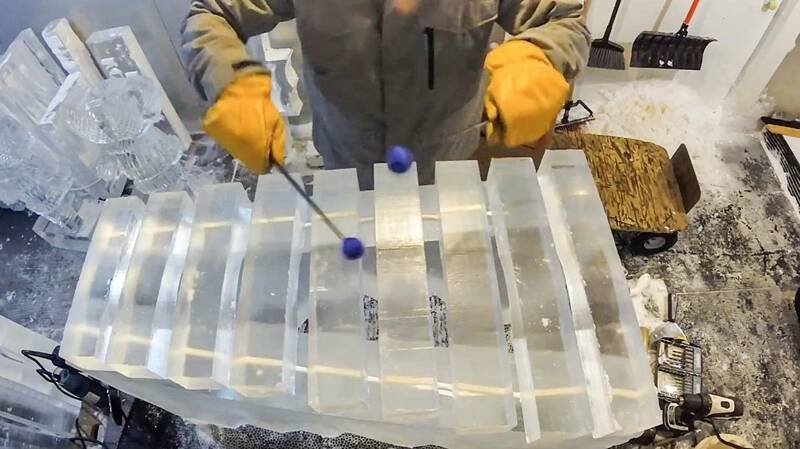 The ice music is the brainchild of Marc Anderson, a percussionist and anthropologist, who also serves as Zen chaplain for Macalester College. Anderson worked with a team of musicians and ice sculptor Trevor Pearson to develop an ensemble using instruments carved from ice. "I've made music on exotic instruments from every corner of the world, but I've never played ice," Anderson says. He adds that it was exciting "to make friends with the lake and ice spirits and create something really special for this great event." The concerts had an improvisational vibe. "The musicians won't know exactly what kind of sound the ice will give them until they are performing," says Bob Amis, longtime Luminary Loppet volunteer, before the event. "Still, or perhaps as a result, the potential exists for something of great beauty to unfold."